When should an employer use “Week 53” in the payroll? This happens when a pay day falls on 31st December or, in a leap year, on 30th or 31st December. in 2018, employers paying wages on a Monday will have 53 pay days, thus a Week 53. BrightPay will know by the payment schedule that was initially set by the user if a week 53 is relevant to the employer - it will only offer a week 53 where it is required as per the payment schedule. Brightpay automatically applies any USC cut off points, employee’s tax credit and cut off points on a Week 1 basis in the week 53 payroll, as per Revenue regulations. If an employee's normal pay day has changed during this tax year or the preceding tax year, the additional USC cut off points do not apply. In this instance, you will need to instruct the software if the additional USC cut off points are not applicable to an employee. 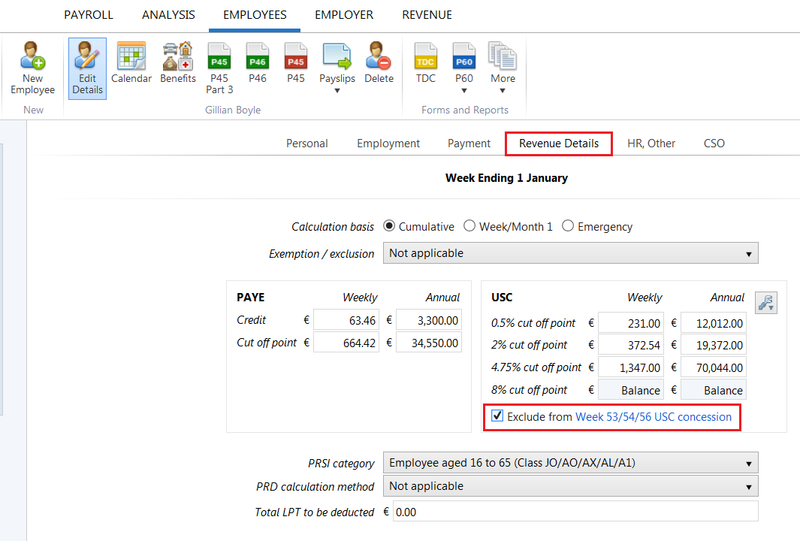 Employees > Select the employee > Click their Revenue Details tab > Tick to exclude the employee from the week 53/54/56 USC concession > Save the change.